Solar projects that have received help from the federal government could be affected by the bankruptcy of a mirror manufacturer that benefited from federal aid. Flabeg Solar U.S. Corp., a mirror manufacturer based in Pennsylvania, filed for bankruptcy on Tuesday after it could not afford to pay several former employees their severance packages, the Pittsburgh Post-Gazette reported. 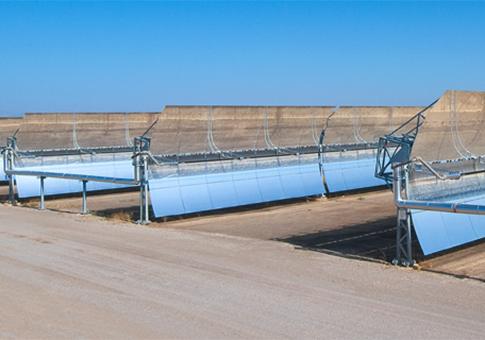 The American subsidiary of a German mirror manufacturer, Flabeg Solar produces mirrors for "concentrating solar power projects" and "other solar technologies," according to its website. It lists two ongoing solar projects, one in California and one in Nevada, as its customers. Flabeg is reported to have received millions of dollars in financial assistance from federal and sate governments. Pennsylvania helped the mirror manufacturer build its plant near Pittsburgh with $9 million in grants and loans. The Obama administration awarded Flabeg $10.2 million in tax credits, according to the Post-Gazette. It is unclear if Flabeg ever used the tax credits. Neither Flabeg nor the Treasury Department returned requests for comment. Flabeg’s website indicates it supplied both the Genesis Solar Energy Project and the Crescent Dunes Solar Energy Project with mirrors. Both projects have received financial support from the federal government. The Department of Energy provided a $737 million loan guarantee to help develop the Crescent Dunes Solar Energy Project in Nevada. The project uses a "molten salt tower" to capture and store the energy. Its owner, SolarReserve, boasts it will be the "largest solar power project of its kind in the world." Construction began on the project in 2011. SolarReserve and the Nevada Office of Energy predict the Crescent Dunes project will come online in 2013. SolarReserve denied that Flabeg's bankruptcy would affect its operations. "Flabeg is a supplier of ‘flat glass’ mirrors and there are a number of alternate suppliers in the market that can be utilized to fill the order if necessary," SolarReserve CEO Kevin Smith said in a statement. "We don’t expect any significant issues," Smith said, praising the project as "a tremendous success story for the United States developed technology and the U.S. Department of Energy's loan guarantee program." The Genesis Solar Energy Project in California likewise received financial help from the Department of Energy. The department partially guaranteed an $852 million loan to support the development of the Genesis project, according to the department’s website. NextEra Energy Resources, the developer of the Genesis project, built the solar energy project in a flood-prone California valley, which performed as expected in the middle of last year, flooding and inflicting "massive" damage on the Genesis project. The California Energy Commission indicates that the Genesis project is just over 43 percent complete. A NextEra spokesman said the project will come online in two phases, half at the end of 2013 and the other half in late 2014. Flabeg’s bankruptcy would not impact the Genesis project and it would not need a new supplier of mirrors, the spokesman said. Flabeg’s website indicates that the mirrors’ "delivery period" was in 2011. This is not the first instance where the federal government has financially supported multiple points on a green energy manufacturing supply chain. Fisker Automotive had to temporarily stop production of its luxury electric car when its battery manufacturer, A123, went bankrupt. A123 was subsequently bought by a Chinese company and changed its name to B456. Flabeg is reportedly open to being acquired, according to the Post-Gazette. This entry was posted in National Security and tagged A123, B456 Systems, Department of Energy, Obama Economy, Solyndra. Bookmark the permalink.